This story was originally posted on May 24, 2009. Did you find the last ‘Terminator’ movie a bit disjointed? With an ever-evolving time paradox storyline spanning the previous films anyone could find director McG’s latest sequel/prequel Terminator Salvation confusing. I’ve followed the ‘Terminator’ films very closely over the years. In an effort to clear things up, I’ve written an abridgment that presents the main points of the complete film series. In the year 2029, Skynet, a global computerized defense network that controls machines called Terminators, is losing the war against the humans. Just before the resistance is victorious, Skynet sends a cyborg Terminator, a Cyberdyne Systems T-800 series model 101, back in time to the year 1984 to kill Sarah Connor, the mother of John Connor who is the future leader of the human resistance. Sergeant Kyle Reese volunteers to go back in time to protect Sarah. 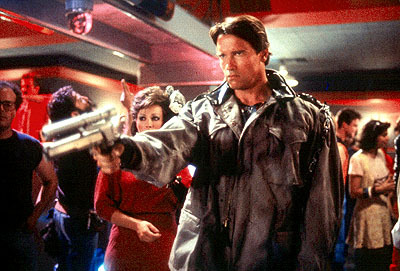 Reese ultimately stops the Terminator. Sarah becomes pregnant with John, Reese’s child. The Terminator’s endoskeleton arm is left behind in a hydraulic press. Ten years later, a manufacturing corporation called Cyberdyne Systems uses the endoskeleton arm to make advances in technology. Skynet sends a new liquid metal Terminator, the T-1000, back through time to kill the 10-year-old John Connor. The resistance sends the T-800 back to protect him. Sarah Connor, now in a mental health facility in California, teams up with her son and the T-800 to break into Cyberdyne. Together with Miles Bennett Dyson the creator of Skynet, they blow up Cyberdyne Systems. Dyson dies in the explosion. The T-800 destroys the T-1000 and himself. They believe they have stopped Judgment Day. In 2003, CRS (Cyber Research Systems) has taken over the work of Cyberdyne Systems. Sarah Connor is dead, without a purpose in life; John Connor becomes a drug addicted drifter living off the grid. Judgment Day is inevitable, it has only been delayed. Because John Connor can’t be found, a new weaponized Terminator called the T-X is sent back to terminate future officers of the resistance. In the future John Connor is dead, killed by a T-800 infiltrator. Kate, John’s wife sends the T-800 back in time to protect her and John before Judgment Day. In order to shutdown a malicious computer virus that is attacking military networks, Skynet is given system wide control over the military. Skynet becomes self-aware and launches an attack on mankind initiating Judgment Day. The T-800 is destroyed while defeating the T-X. John and Kate survive the attack inside an old military fallout shelter called Crystal Peak. In 2003, a murderer on death row named Marcus Wright donates his body for research to Cyberdyne Systems. He mysteriously wakes up in the year 2018 to find an ongoing war between machines and humans. Wright teams up with a teenage Kyle Reese, who will become John Connor’s father in the future. The resistance uncovers a way to cut off a signal that Skynet uses to communicate with the machines. John Connor volunteers to test it. When Reese is captured and taken back to Skynet, Wright, who is really a cyborg with a human heart, must team up with a reluctant Connor to save Reese. At Skynet, Marcus Wright learns he was programmed to infiltrate the resistance and lead Connor back to Skynet so he can be killed by the T-800. Together Wright and Connor defeat the T-800 and blow up Skynet. Connor is injured during the battle. Wright volunteers his human heart to save Connor and symbolically receives salvation for his past crimes. The Terminator (Remastered) blu-ray and Terminator Anthology blu-ray are available now.